Arrive at Dongzhimen Subway Station by line 2 or 13 and get out from Exit H to find Dongzhimen Transit Hub. Take bus 850 or 918 there to Guanzhuang Lukou, and then head northwards along Misan Road for a few yards to take bus 918 Interval to Guanshang Village and start the hiking there. Go southwards along Huguan Road and pass by Yangjiatai Village to reach Shijiatai Village. Pick the cement pavement to the southwest when you arrive at a fork at the southern end of Shijiatai Village. 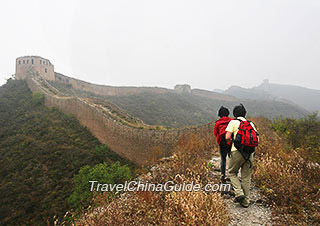 Go along the road for about 10 minutes and follow a gravel path to Sizuolou Great Wall. There are cloth strips bound on the branches by other hikers leading you the way. 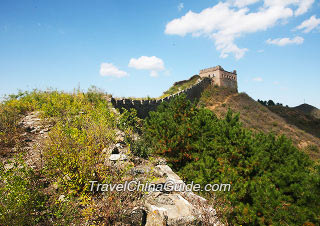 After going through a pine forest, you will see the watchtowers of Sizuolou Great Wall. After touring around, get downhill from the watchtower at the western end onto the Pinggu International Walking Road. Hike all the way to the south to Beizhai Village and take bus no. 39 there to Pinggu Qichezhan. Then transfer to bus no. 852 back to Beijing. Sizuolou means 'four watchtowers' in Chinese. As its name indicates, there were originally four towers connected by ramparts, but now only three of them are still remained. The one at the eastern end has been torn down to build a signal tower. Sizuolou Great Wall was constructed in the Ming Dynasty (1368 - 1644). Lacking of renovation and protection, the ramparts had collapsed many years ago. Shaded by lush plants, the remaining watchtowers are like mysterious castles waiting for backpackers to explore. When you get closer, you will find many bullet holes on the walls, which were left during the Second Sino-Japanese War from 1937 to 1945. This road is the first hiking avenue in China that meets the international standard. Winding around a mountain, it starts from Beizhai Village, passes by Sizuolou Great Wall, and finally ends at Xiong'er Cottage, stretching for 23 kilometers (14 miles) long. It reveals the best view during spring from March to May. At that time, wild flowers are in full bloom and overspread the land on the roadside. Take a look around and you will have an eyeful of lush plants covering the rolling mountains. If you come in autumn during September ~ October, the tree leaves will turn golden and the mountain will look shining under the sunshine. 1. It is suggested you find some companions for this independent Beijing tour to Sizuolou, or hire a local guide if necessary. 2. You are advised to arrive at Beizhai Village before 16:50 when the last bus no. 39 leaves for Pinggu District. 3. You can take a break at special resting places along the Pinggu International Walking Road. There are also booths selling bottled water. 4. Toilets can be found near the Luyou Square and the 10km Terminal along the Pinggu International Walking Road.